With a name like John Richardson the singer-songwriter is unlikely to be Finnish, yet this dude has made a home in Turku, Finland helping out many Finnish musicians with his contributions, teaching music, and now releasing his own albums. Svart, being an eclectic label as they are, will release anything worthy of their attention if prominent Finnish musicians are involved, and Kimi Karki (Reverend Bizarre, Lord Vicar) helps John Richardson on electric guitars and Anna-Elena Paakkola is lending her backing vocals on The Fold. 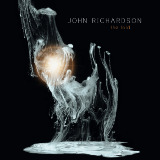 John Richardson's first modern era solo album is a mix of folk rock and coffee shop crooning. At times full bodied with stumbling jazzy rhythms (title track, Sanatorium), the overall atmosphere is dreamy, but growing darker and more brooding at times (Sanatorium). The softer, completely detached floating mood (Dawnsong) is also present, which affords moments of almost carefree relaxation. John's voice is a soothing half spoken croon, but he does push himself vocally when Sanatorium gets denser, with increased bass levels and piano providing vivid touches. Strings, synth and unusual Finnish native instruments are responsible for other quality coloring touches on The Fold palette. I will be frank and say that there were tunes on the album I found a little boring (Tumbleweed Days), so the reprise of it at the end means me and John are not entirely on the same wavelength for what he thinks his better compositions are. Yet, I liked Riptide (Three Broken Screens) growing dramatic and orchestral to a tune of painfully familiar melody I tried but could not place. Birdman of Bognor is a special tune which swings completely for the fences with its special (folk Irish?) hook. Open Page (Journey to Enceladus) brings the feeling on an English grassy countryside on a sunny day, is also quicker and more upbeat, thus contrasting well with preceding Sanatorium and its more somber spirit. With a couple of aftersongs (or afterthoughts) coming after Tumbleweed Days reprise The Fold seems to be extended unnecessarily, and a little anti-climactic after the powerful Riptide, but the album certainly has its cool soothing, and at the same time fun, moments to explore.